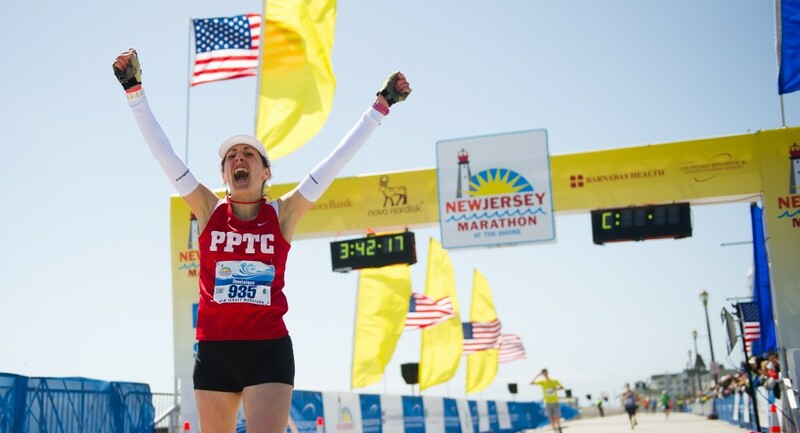 Thank you for registering for The 18th Annual Novo Nordisk New Jersey Marathon Weekend. In an effort to make your participation more enjoyable, here is the fifth in the series of weekly messages. Copies of these updates are also available on our Website. Our Half Marathon/Relay course was certified by the USATF last year and will remain the same this year (a course certification lasts for 10 years, as long as there are no changes to it). A static course map is on-line on the Half Marathon and the Relay pages on our website, as is a scalable course map. Our Full Marathon course, which shares approximately the first 11.6 miles with the Half/Relay course, is almost completed. The holdup is due to repairs which are currently underway on the Asbury Park boardwalk (it is completely ripped up between 3rd Ave. and Convention Hall at 5th Ave). We have been told that it will be ready prior to race day, but in its current condition the USATF Certifiers cannot measure that section. As a precaution, we are looking at three alternatives: one which will take the course off the boardwalk completely heading southbound, and two other options which will either leave the boardwalk at 3rd Ave. for a few blocks or never return to the boardwalk after the exit at 3rd Ave., heading northbound. Having these alternatives will ensure that we have a fully certified full marathon course even if the boardwalk repairs are delayed for some reason. In addition, Ocean Grove has not completed storm related repairs to the northern end of their municipality and that will cause us to reroute entry into Ocean Grove via a foot bridge over Wesley Lake instead of using the more direct land route between Asbury Park and Ocean Grove. However, this year we will only use a footbridge approach to Ocean Grove when heading southbound, and it will be the eastern most footbridge. This will eliminate the narrow walkway we were forced to use in 2013. We will use the direct route between Ocean Grove and Asbury Park this year heading northbound and that will allow access to the Asbury Park boardwalk (either the entire length or a portion of it (as discussed above). We are very fortunate to have eight very supportive communities which host our courses! It is not possible to describe fully the tremendous support each of them has provided in moving forward during these repairs! We are very grateful to them for caring about these events! Our 5K course has been sent to the USATF for certification. It will start and end at the finish line of or Sunday races, on the Oceanfront Promenade in Long Branch. It will head south through Pier Village with a turn-around in the southern part of Ocean Ave before returning through Pier Village to the finish line. Fluids: We will be providing Gatorade-Endurance Formula (lemon-lime flavor) and water at each of our Fluid Stations, with Gatorade served first and water served second at each station. Most Fluid Stations will be less than 1.5 miles apart and will be staffed by many service organizations and charity volunteers. The first three fluid stations will be configured on both sides of the road, so there is no need to cross to the opposite side for fluids. These dual sided fluid stations are staggered so that the middle of the course is not blocked by participants trying to take in hydration. There will also be trash bins near each fluid station for your use. Please use them for Energy Gel tops and packs, banana/orange peels, cups, general garbage, etc. We appreciate your efforts in keeping our neighborhoods and course as clean as possible during the races by using the trash bins. Energy Gels: GU energy gels (vanilla bean and jet blackberry are expected) will be at multiple locations between miles 13 and 22. Please be prepared to carry your own favorite gel packs (the ones that you have been training with) if GU is not the brand which you’ve been using. You are of course welcome to the GU in any case, but you may be jeopardizing your race if you use anything which you haven’t tested during your training. We will have over 7,000 GU energy gels on the course to service our Full Marathon participants. Bananas: Will be located on the marathon course between miles 13 and 22, a good source of potassium. Toilets: We will provide portable toilets at the Start & Finish areas, as well as along the course. On the course they will be located at, or very near, each Fluid/Aid Station. If you do not see them, just ask a fluid station volunteer to point them out to you. Please do not relieve yourself on private or public property! Local Police will be called if anyone is observed doing so. This is behavior reflects badly on us all and on our sport. Clocks & Mile Markers: We will have timing clocks throughout the courses, large mile markers at every mile and B-Tag timing mats at the Start, Finish and at multiple locations on the courses. Please note: Between miles 6 and 11 there will be two clocks at each mile marker. One for the half marathon/half relay and one for the full marathon. These clocks are there as the fastest full marathoners will overtake some half marathoner and half relay athletes in these miles. Please listen for instructions from the course marshals to make room for the faster marathoners. On Course Safety: I know many of you train with music and headphones. The organizing committee strongly recommends that you leave your headphones at home for safety reasons. You need to be aware of your surroundings, your fellow runners (who may be passing) and the possibility of emergency and race vehicles and even errant traffic on the course (we work hard to ensure that traffic will not get onto the race courses but it only takes one careless, determine motorist to cause a potentially dangerous situation). Medical: In the event of an on-course illness or injury there will be 15+ EMS locations along the course with mobile medical transport facilities between them and local area hospitals will be on standby. In addition, there will be a major medical complex at the finish line as well as local emergency rooms fully staffed and managed near the race courses. EMTs will always be nearby during your race to assist with any question/issue you may have. It is required that each participant complete the medical information on the back of their race bibs. A Safety Warning System will be used to communicate race status to all participants, volunteers and race staff with respect to weather and safety conditions. It will be a simple color coded warning system. CAUTION – Heat index is at a Caution point and athlete should slow down and hydrate properly. DANGER – Either Dangerous weather exists and athletes should slow down further and monitor their hydration even more carefully, or lightning and/or tornado(s), etc. are reported in the area and ALL ATHLETES should take cover at the closest shelter until the course is reopened. Be sure to heed the directions of the race staff. The race may resume when/if appropriate. CANCELED – Race has been Canceled due to extreme weather or an on course emergency has occurred and all participants need to leave the course/seek shelter immediately. The regular shuttle buses will be re-targeted to help evacuate athletes to shelters. The Safety Warning System will be located near each fluid/aid station, so please keep an eye out for it. Fluid station personnel will be reminding you of the current race condition (warning system colors) whenever a non- NORMAL condition exists, and they may be directing you to the nearest shelter for your own safety. Dangerous conditions are very unusual during our races, but please remember to look for the current Warning System color and listen to staff instructions as you approach each fluid/aid station. As in previous years, there will be bands, DJs, cheer zones, etc. at various places along the courses, for the enjoyment of the athletes, spectators and volunteers. Please note that we are restricted by noise ordinances in several locations. Please note: We will publish course maps with fluids/GU/banana, etc. locations, turn-by-turn directions and a list of the entertainers and their locations as soon as we have finalized those details. I hope that this information will help in your on-course race planning. Please let us know if you have other questions about what to expect on any of our courses. Next week’s topic: The Finish Line and Finish Line Festival Area. This entry was posted in Race Info and tagged Clocks, Course facts, course updates, EMS, EMT, Energy Gels, Entertainment, Fluid/Aid Stations, Gatorade, GU, Medical, Mile Markers, On-course, Safety, Toilets, Warning System. Bookmark the permalink. are hydration packs allowed (I train with a small hyradation pack now will that be allowed during race? If the hydration pack ONLY holds a hydration bladder that’s fine. If on the other hand it has pockets to hold other things it’s not allowed. BTW – If you have an acceptable hydration only bladder you may be required to take a drink of the liquid before you’re allowed into the start area. Our Race Director is meeting with the security forces again this Thursday. If anything changes we’ll post it on Facebook and Twitter, and on the “Security Info” page on our website. If it only contains a hydration bladder it’s fine. If it has storage compartments it is not allowed. Hi, I’m glad that you found it helpful. Thank you for taking the time to let me know! or blog posts in this kind of space . Exploring in Yahoo I finally stumbled upon this website. right uncanny feeling I found out just what I needed. I such a lot indubitably will make certain to do not disregard this web site and provides it a glance regularly. Have yyou ever considered writing ann ebook or guest authoring on other sites? your work. If you are even remotly interested, feel free to send mee an e mail. Thank you! Glad that that you found it useful. If you think that coupon clipping is an outdated practice, guess again. Coupons can save money on clothes, food and everything else. You can frequently get items cheaper and coupons can help. Here are some smart ways for you to use coupons. income. low cost oakley eyewear shop Along with assistance of yourquite a while obsoletea guarantee against the wages low-cost oakley shades with all the loan company. With this using, position plus a good availability of an energetic family savings in most reputed loan company of your money might be credit score on the anyone in case you are18 , retain nationality from the location in which these are personal offers while using the unanticipated financial sit ups in addition to charge associated with imminent costs. I’m guaranteed that’s the right thing to accomplish intended for growers, yet I’m not certain it’s the right thing to try and do to the environment. Your Clean Water Refurbishment Take action of 3 years ago would likely increase the guru of the Epa and the Corp with Affiliate marketer Fitters above navigable ocean and also create as well authority more than surface marine environments. This provides you with that the capability to control things to do of which bring pollution out of run off, contaminants through trash dumps plus sewage lagoons escape coming from pesticides or herbicides, along with chemical like manure. Along with your pesticide remedies available today are generally among Twelve plus 75 times more potent than these purchased in 1975. Close to 85-90% of pesticides or herbicides utilized for agriculture never accomplish goal microbes, instead propagate in the surroundings, garden soil, as well as waters. 1 / 3rd from the water wells Oakley Online screened around California’s San Joaquin Vly throughout ’88 included this insecticide DBCP on quantities Significantly over the ideal Oakley Online permitted to get risk-free ingesting water-more than just a decades immediately after it is utilize has been suspended. Ninety-five per-cent Oakley Online of all water on the planet is soil mineral water. The regular time frame groundwater is always within an aquifer is usually Just one,300 years, versus Sixteen days pertaining to lake h2o. This implies correct a long term task for example prevention is the best Oakley Online option, Estimations propose that practically 1.5 million folks deficiency harmless mineral water Evidently, the issues involving water pollution hold the functionality to help interrupt lifestyle with a planet-wide schedule. r Global enviromentally friendly fold Oakley Online is quite possible. We can’t identified far sooner as opposed to to past dueignore groundwater smog regardless of economic penalties to help agriculture. Being a farmer In my opinion some sort of Oakley Online controllable resolution must be .